I went freezer diving the other day and found some meat that needed to be used, the first being a package of center cut pork chops that were still in the store packaging. I was totally surprised when I removed the top two and found the unseen two chops to be just as nice. I decided to give them the same treatment as I sometimes use for BBQ ribs which is a blend of two Billy Bones seasonings and a baste of Tennessee River BBQ Sauce when I flipped them. I cooked them on the gas grill with some romaine lettuce and bacon wrapped green bean bundles (also from the freezer). It made for a fine meal but while the chops, cooked to 145*, were moist and tasty, they were a little sweet for my taste – you sweet lovers would have really enjoyed them. A freezer is a magnificent invention and it would be hard for us to live without one (or four). For the steaks, I used a boneless rib roast that was dated Oct, 2012 and since I knew, at worst, it might have some freezer burn, it went onto the menu. I had wrapped it tightly in plastic wrap and then aluminum foil (that’s tin foil for some of you J) and when I unwrapped it I found no issues at all. I had saved it from the purchase of the whole rib to make into prime rib but Bev has decided she much prefers it as a grilled steak. I gave each side a coat of Montreal Steak Seasoning and grilled it over charcoal along with some par-boiled, bacon wrapped potatoes and plated everything together – I obviously wasn’t going for a great shot. Bev said several times through the evening that this was the best meal she’d had in a long time – I enjoy heroing for her. But, this part of the post is not really about the meal but rather to say that properly wrapped meat can be kept in the freezer for quite a while – we must have been out of vacuum sealer bags when this was wrapped. I’m sure we have some stuff that can’t be used, but I was pleasantly surprised by this one. Here's a little something to ponder on. When you buy from a small mom-and-pop business, you are not helping a CEO buy a third vacation home. Our customers are our shareholders, and they are the ones we strive to make happy. We are in the process of doing a little downsizing = getting rid of stuff that has been clogging the closets, bookshelves, garage, etc. We have a lot of books that we never use and my initial plan was to take them all to the library and let them sell them to raise money, but it occurred to me that many of you enjoy cookbooks and might put ours to good use. Before I do something else, I am offering them to you for the cost of a box and postage. They range from very good to like new condition (which is why they are leaving here). All you have to do is tell me (via comment here or email) which ones you want, the address to mail them, and send me a check when they arrive. These last four may be the real gems as they are family recipes. They will be first come, first served and don't be afraid to be assertive - it's cheaper to send them all to one address. Footnote: A whole clean-up is obviously a two person job and while I'm working on books and the garage, Bev decided to work on MY shoes, reducing from 10 pairs to 5, but she didn't bother with her hundreds of pairs - slight exaggeration. Several of you have asked about Madison so I decided to do a little post about her. 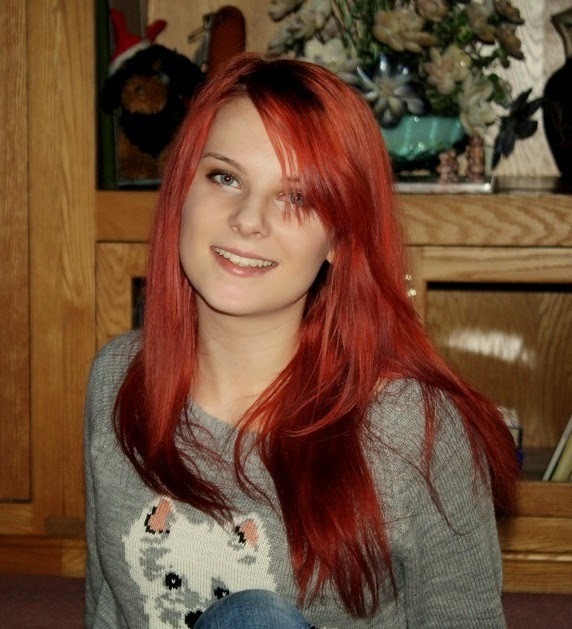 She is a lovely and pretty typical 16 year old – the second part is a negative. She does on-line school and is about to finish her freshman year assuming she can get through Algebra I and she has a B+ average so far. For most of the time we’ve had her, she was generally in a bad mood and we assumed it was psychological and a result of some of her medications but during a recent doctors visit, she was discovered with very low vitamin B level. She began taking a supplement and it’s like a different person is now living with us. She spent Christmas with her boyfriend in LA and flew across the country by herself as a major event in her life and the plan is for her to go again in May for his prom. She and Bodie are enrolled in dog training classes and she now has both he and Coco doing tricks – she is very patient with them which supports her stated desire to have a career in the animal field. As a further reinforcement, she is really enjoying volunteering at the local animal shelter – where, of course, she does things she won’t do around here. Several years ago, she expressed an interest in modeling and we have restarted that process – she is pretty, curvy, and very photogenic so this may also be an career option for her. If we could only inspire her to enjoy RVing we would have it made. MY BLOG - I just finished a big day of BBQing and didn't even think about taking photos for a blog post. I also notice I've been slacking off on my posting and this tells me I need a blog semi-break. So rather than post every day, or three times a week, or ...., I'm just going to post when the spirit moves me, but I'll be reading yours as usual. I hope you'll continue to stop by. I've never forgotten that lesson. I also learned her name was Clara. With spring gardening now upon us and fresh markets opening in some parts of the country, I thought I’d make one final post from our winter Florida trip. Unlike many of the markets we attended, this one had few, if any crafters, but rather produce, food to eat, and plants, and it was located on the Inter-coastal Waterway. It is open Oct 5, 2013 through May 31, 2014. As you can see from these first shots, it was well attended as were the others we visited.